How will the French elections affect the Euro? With less than a week to go, the presidential campaign in France has been aggressive and dramatic. Eleven candidates have joined the race and for the first time in 15 years, the far-right National Front candidate, Marine Le Pen is in with a chance of winning. On Sunday April 23rd, the French go to the polling stations for the first round of voting for the next President. In the event that no candidate wins a majority, a run-off election between the top two candidates will then be held a fortnight later on Sunday 7th May. This will be the first French presidential election in which nominees of both the main centre-left and centre-right parties were selected through open primaries. The presidential election will be followed by a legislative election to elect members of the National Assembly on 11 and 18 June. Emmanuel Macron would be best for the Euro. So, will it be Marine Le Pen, Marcon or Fillon. Ranked as the second most influential members of European parliament last year, Marine Le Pen, a French lawyer, was elected to the European Parliament in 2004 and currently represents the North-West France as the president of the National Front political party. Her focus includes a fixed retirement age, closure of ‘extremists’ mosque’s and negotiation for a new EU. Interestingly, Le Pen follows Trump’s ideology and May’s stance. Her policies are France first and ‘Frexit’ (making France leave the EU). Emmanuel Macron born 21 December 1977 is a French politician, senior civil servant, and former investment banker. Born in Amiens, he studied Philosophy at Paris Nanterre University, completed a Master’s of Public Affairs at Sciences Po, and later graduated from the École nationale d’administration (ENA) in 2004. Macron has a very good chance of becoming France’s youngest president ever. Before being elected as economy minister in 2014, he worked as economic adviser to President Hollande. He resigned in April 2016 before announcing that he will run for the Presidential elections. Macron wants to invest in job-training, focus on infrastructure and modernisation, cut in jobless rate and ban mobile phones in schools for the under 15s. François Charles Amand Fillon born 4 March 1954 is a French politician who served as Prime Minister of France from 2007 to 2012 under President Nicolas Sarkozy. He is the current nominee of the Republicans (previously known as the Union for a Popular Movement), the country’s largest centre-right political party, for the 2017 presidential election. Fillon studied law and married Welsh born Penelope Kathryn Fillon in 1980. He is among the favourites in the race. He wants to remove wealth tax, scrap half a million public sector jobs and help Syrian President Bashar al-Assad crush the Islamic State. For the first round, the polls are unpredictable, the most unpredictable seen in history. Polls indicate that Fillon and Le Pen could get to the second round. How the markets are coping ahead of the French elections? France is one of the most influential economies in the European Union. For a long time, France has contributed massively to European politics. Undoubtedly, the big vote on Sunday will bring volatility to the markets and will also impact the Euro currency. Market participants will be keen to see if the Euro will be stronger or will witness a flash crash. This will all depend on which candidates go through to the final leg of the race. But, the story of the Euro also depends on the Pound, Dollar and Japanese Yen. According to some sources, if Le Pen wins people would be taking money out of the Euro. Some analysts trust that Fillon will be the best for the Euro if he makes it to the second round. He also has the support of Nicolas Sarkozy who asked his fans to unite with François Fillon on one of his Facebook posts. From a Euro perspective, only outcome 3 will have a large impact (almost certainly a rally on Monday for the common currency) as markets have likely priced in Le Pen’s presence in the second round. Accordingly, it is in the head-to-head stage of the election that markets will be most jittery. A win for Marine Le Pen would be disastrous in the short term for the Euro, while a victory either of the other candidates would probably see a relief rally. 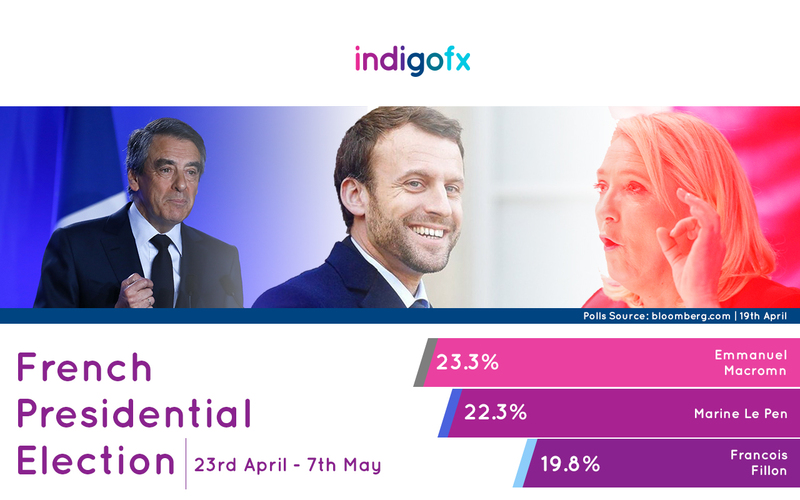 Indigo FX believes that Emmanuel Macron would be the best-case scenario for the Euro. It would damage sentiment and investment given the additional uncertainty. French growth might receive a short-term boost from looser fiscal policy but it would ultimately suffer from the stalling or perhaps even reversal of labour market reforms. Increase uncertainty due to a likely referendum on the euro — possibly triggering a new debt crisis. By raising the possibility of ‘Frexit’ Le Pen will naturally lead to an intensification of political uncertainty not just in France but across the region as a whole, and at the minimum dampen euro area investment and consumer spending in the short term. Anything could happen on Sunday and the Euro will now be dominated by political uncertainty as the market awaits the results on Monday! Will the election results affect your currency buying decisions? Call one of our traders today if you would like to implement a hedging strategy to protect your businesses bottom-line.